This post is the second in a series of ‘meet the expert’ articles about worldwide investigators working in virology research. These posts are written by the CVR students and researchers and are designed to educate, engage with and inform the public and fellow scientists about who we are and what are our motivations. Joanna Morrell, Ph.D. student in the lab of Pablo Murcia, had the pleasure of interviewing Professor Peter O’Hare, a fellow countryman from Northern Ireland, when he was a visiting speaker to the MRC-University of Glasgow Centre for Virus Research as part of the external seminar series. Peter is the Chair in Virology at Imperial College London, where he is a group leader of research involving herpes simplex virus (HSV). For the interests of those who don’t know, can you explain a little of what your research is about? I have historically covered quite a bit, but have always been in the alpha herpesviruses and [HSV]; this large double stranded DNA virus with a complex life cycle. 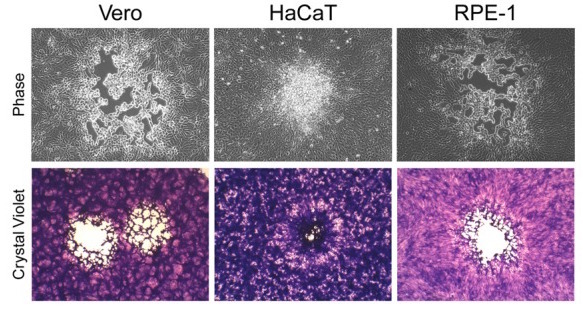 It’s always been a prototype for a lot of the herpesviruses as it was a tractable system for studying them; I think that’s changing now with human cytomegalovirus (HCMV) and Epstein-Barr virus (EBV). But it’s still true that the alpha herpesviruses tell us a lot about some of the generic features that are applicable across all of the family. More recently I have been turning to transcriptional regulation and the cell biology of HSV infection, to fundamental questions about the first 30 minutes of an infection. How does this virus, after fusion, interact with the host? How does it escape immune responses? How does it provoke immune responses? How does it travel to the nuclear pore? And in particular we are very interested in what’s a bit of a black box, how this genome gets into the nucleus and then it’s transcribed by RNA [polymerase] II after the first wave of transcription. That’s one area that we’re focusing, the very early stage of virus to host interaction. I have a few other projects in the lab that I’m very enthusiastic about – chemical biology and ‘click chemistry’. We interacted with chemists and they described to us techniques they had available that I don’t think they really knew how they could be applied to biology, because they’re not biologists. And on the other hand, we didn’t really know that we could do these things because we’re not chemists. So we happily came together and we’ve now expanded and are using click chemistry in many other programmes. I have another programme of work, that is slightly separate from virology, to do with stress at the endoplasmic reticulum, and signalling to transmembrane transcription factors. It’s a fascinating field about gene control, and how DNA binding is ultimately about what happens at the ER. It’s always interesting to hear how people started off on the path to becoming a scientist, can you tell me a bit about how you ended up as a professor in a prestigious London institute? I think it goes back to your youth and what you learn there about experimentation. Actually in some ways I fundamentally believe that everybody is a scientist, certainly when they are born, and sadly in some ways they lose science. Probably at the level of secondary school it becomes slightly less “cool” to some people. Before that at primary school, if you get them right, actually everybody is a scientist; it’s about exploring. I think that’s what got me into it, I came from a background where we were encouraged and allowed to do that, we had the required chemistry sets, which people don’t seem to have too much now. We were science oriented, we couldn’t wait until a magazine called “Understanding Science” came through the door, so we were brought up like that – enquiring – and I guess that sowed the seeds of an enquiring mind, and luckily I maintained that through university and then knew I wanted to be a researcher. It’s a slightly longer journey, and probably more boring, about how you end up where you are now. It was a pretty conventional career of going and pursuing a PhD, luckily for me that was in a fantastic era in the National Institute of Medical Research with a fantastic supervisor, and a great time in the department of virology. From there onto another prestigious institute John Hopkins, which was almost a city devoted to science and was very successful; and then into a smaller institute, the Marie Curie institute, that was devoted to science. And now onwards from there to Imperial College, and that’s a potted history of how I came to be where I am. Herpes virus is commonly used as tool for studying biological cellular processes, why do you think that is? Well I guess that’s a little bit of history. Interestingly I think there are probably two main reasons. One of these is that it grows well in tissue culture. It was a virus that you could isolate, and identify it as a herpes virus, of course seen by electron microscopy and classified genetics. Back in the 50’s and 60’s we were able to grow herpes viruses, HSV in particular, with a rapid growth cycle and a productive cycle, so it became a virus that was tractable and you could study it. Another reason is to do with Glasgow of course. In my experience there were probably two main centres of herpes virology, one in Glasgow and one in Chicago. In Glasgow there was a history of tissue culture – the development of different cell lines and the ability to grow viruses – pioneered by the heads of the MRC Institute of Virology here, which has now evolved to become the [MRC-University of Glasgow] CVR. That is one of the reasons why in particular HSV, and of course other viruses, have been explored more in the CVR. So I put Glasgow on the map as one of the reasons, and the general history of tissue culture in virology, why herpes viruses became a virus of choice, amongst several others. Then having said that we mustn’t forget that in DNA viruses, [simian virus] 40 and adenoviruses have given us a tremendous amount in terms of fundamental molecular biology along with herpes viruses. What would you say is the biggest question in the field of herpes? Well that’s a huge question! I mean you go from across molecular biology to clinical questions. Clinically there are big questions: will we ever get a vaccine for some of these viruses, and why are we not being successful with vaccine development? Having said that, there is of course a vaccine for varicella that’s been developed and that is now routinely employed in several countries, Japan and America, but in Britain we do not routinely vaccinate yet. Whereas for HSV there have been vaccine trials that have failed; and for EBV and for HCMV, both problematic viruses, we don’t have a vaccine. In terms of drugs, of course we have acyclovir and it’s derivatives, but it might still be argued that we still need better drugs for gamma herpes viruses, that they are still problematic and that they are not particularly effective against those viruses. So clinically there is still work to be done. The other questions are about other aspects of the mechanisms of pathogenesis and the mechanisms of replication, evolution. 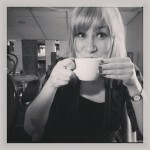 If you’re asking what do you think are the questions in my sphere? Well there are some pretty fundamental things in terms of the generic aspects for these virus replicate, all of them, which we don’t know, and that is partly what I focus on. It is not really sufficient that we know virtually next to nothing about precisely how all of the viruses enter the nucleus, how they actually really get in, in true mechanistic detail. We have descriptions, the virus should fuse and travel along microtubules and in axons for long range transport, travel along cytoskeleton architecture, somehow navigate the organising centre and somehow engage with the pore and somehow undergo some conformational change which then lets the genome out. But it’s a descriptive thing, and yet it applies to all these viruses. And I’d like to understand that in true mechanistic detail. Another phase of the life-cycle is truly how do they get out of the nucleus, and what are the events that are to do with fusion between the inner and outer nuclear membrane that allows the virus to pass through? That question will be answered in different ways by people who work in different fields about what do you think are the key questions. The other that I’m very interested in is the seminar that you heard about today, and the reason that currently excites me is that we are uncovering things that we didn’t know we had to know the answers to, we didn’t know they were there. And of course those are very interesting processes, we just didn’t know we had to understand them. And so the term that I have for virus induced remote signalling is saying that there are processes going on where the virus is inducing uninfected cells potentially preparatory responses to its own ends that we simply did not comprehend. And finally, if you hadn’t been a scientist what do you think you would have done? I think probably three things. I have a passion for photography which I dabble in, and I would have loved to have been a professional photographer and made a living out of it, but that’s just wishful thinking. Then I would have loved to have been a carpenter and then I would have been an actor. In that order; I think that’s what I would have been. With thanks to the rest of the blog contributors for reading critically. 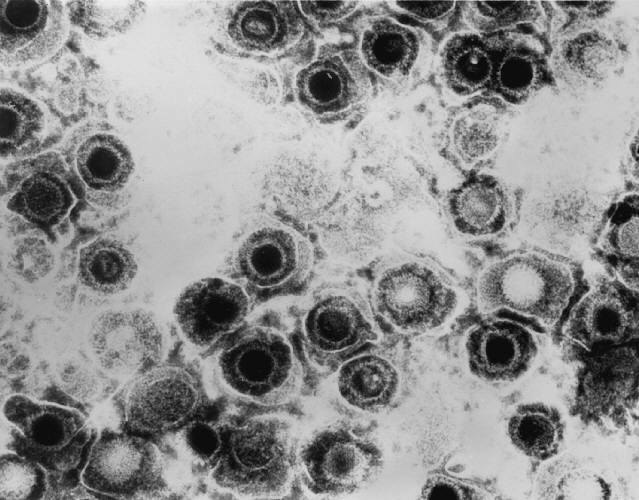 Herpesviruses – in the taxonomic order Herpesvirales – are large enveloped viruses with big double-stranded DNA genomes (encoding up to 200 genes [compare that to the ten ‘genes’ of hepatitis C virus]) that infect an incredibly wide array of species including vertebrates and invertebrates. Some herpesviruses are pathogens of humans and animals as well. 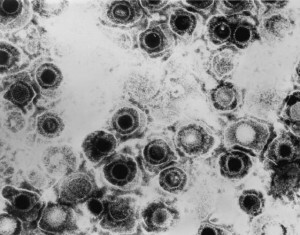 Of note, clinically-relevant species in humans include: herpes simplex viruses (HSV) 1 and 2, which can cause oral and genital herpes or ‘cold sores’ and are significant sexually-transmitted diseases; the varicella-zoster virus (VZV) that can cause chickenpox and shingles; and human cytomegalovirus (HCMV), which cause infectious mononucleosis or can lead to developmental problems and/or prove fatal following congenital or newborn infection. What unites this group of viruses is that they are masters in latent infections and can survive within a host for decades only to eventually ‘re-activate’, as anyone with cold sores or who has had shingles can contest. Contesting to their efficient means of spread the majority of humans have evidence of past infection with a herpesvirus. There exists limited treatment options for these viruses and there is only a vaccine licensed for VZV while there is a clear clinical need for other herpesvirus vaccines in humans and animals. Because of this the herpesviruses remain interesting from a clinical and basic science point of few. The MRC-University of Glasgow Centre for Virus Research undertakes a broad cross-disciplinary research programme into herpesviruses, ranging from their genomic analysis (including human and animal pathogens); their structural biology; and their cell biology interactions with the human immune system. This research is led by the principal investigators: Andrew Davison (genomics and taxonomy); David Bhella and Frazer Rixon (structural biology) and Chris Boutell and Roger Everett (cell biology and innate immune interactions).